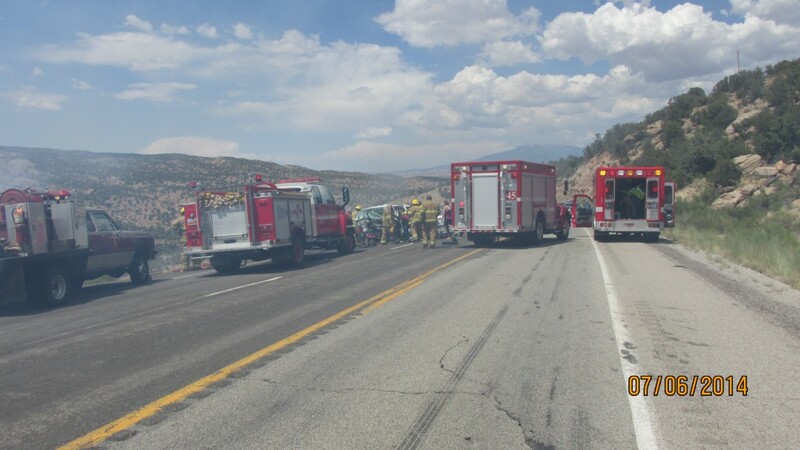 SAN JUAN COUNTY – Five people are confirmed dead, with two other people in critical condition, after a head-on collision Sunday on state Route 191, mile post 81, in San Juan County. The collision occurred at approximately 2:30 p.m., on Peters Hill about 13 miles north of Monticello. 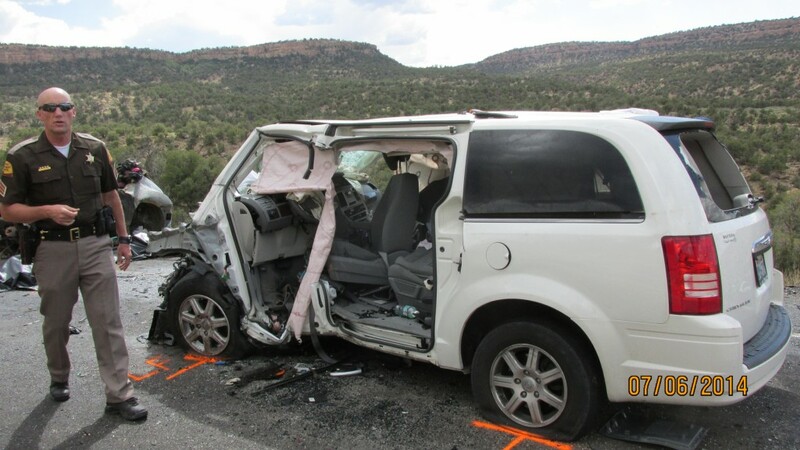 A van with five occupants traveling northbound made a bad pass, and crashed head on into a sports car with two occupants headed southbound, Utah Highway Patrol Trooper Evan Kirby said. 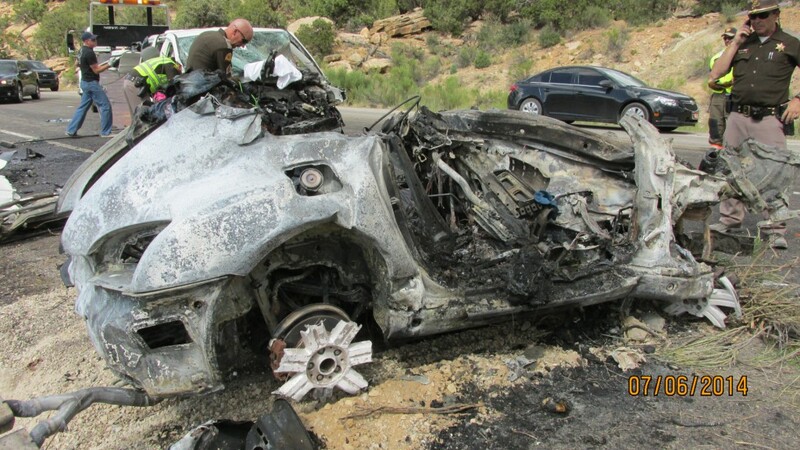 The sports car caught fire and its momentum from the collision carried it off a steep embankment, coming to rest about 100 feet below the roadway and burning completely. A small brush fire started but was quickly extinguished by fire crews. Witness statements indicate that the driver of the van was passing when the collision occurred. The two occupants of the burned sports car were unable to exit the vehicle and died. Three of the five people in the van also died, including the driver. The other 2 occupants were life-flighted to area hospitals in critical condition. This report is based on preliminary information provided by UHP and may not contain the full scope of findings. People need to be very careful on these two lane roads when they are trying to pass some one. I have had people do some really stupid things when they think they have to pass me and up to three other cars at the same time. I drive from La Verkin to Springdale often. The traffic conditions there are perfect for this type of tragedy to happen. Hurricane to Fredonia AZ is another place where speeding cars do this pass everyone in front of them stuff. I don’t like being the innocent vehicle coming towards them when they do this as I often have been, it just hasn’t resulted in a bad accident yet. If you don’t value your own life think about the people in the other vehicle you might hit before you do your fancy, speed passing. I wonder if wrecks like this give the rescue crews nightmares or if they get used to it?? According to an update by San Juan Record, the death toll is now 6 with 1 still in critical condition. How horrible! My heart goes out to the victims and their loved ones. I hope the remaining survivors recover fully and quickly.